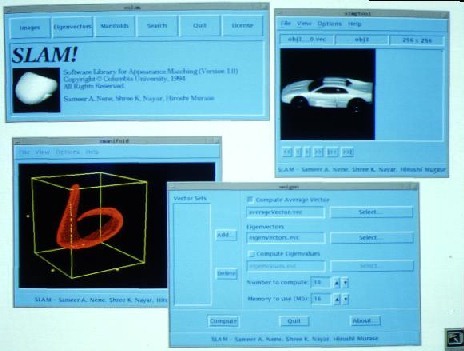 The SLAM software package (see video) was developed at the CAVE lab at Columbia University in the City of New York. To download the software package click at [SLAM]. Be sure to look at the file "GettingStarted.txt". Please feel free to direct any questions to slam@lists.cs.columbia.edu. Let us know how your experiments go. "SLAM: A Software Library for Appearance Matching,"
Vol. 1, pp. 733-737, Nov. 1994. "Real-Time 100 Object Recognition System,"
Vol. 3, pp. 2321-2325, Apr. 1996. "Visual Learning and Recognition of 3D Objects from Appearance,"
Vol. 14, No. 1, pp. 5-24, Jan. 1995.